A more incentive to eliminate enemies in Minecraft. 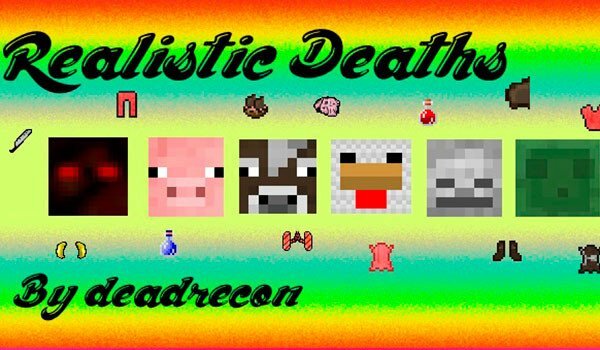 Realistic Death 1.7.10 is a mod that will begin to deploy their capabilities at the right time we finish with the life of an animal or mob in Minecraft. Removing them will have a probability that the mob or animal drop his head. If we make right click on this head with a knife, obtain various parts of the mob. These “parts” of animals or monsters will help us in two ways. First, some of those parts we can cook and eat, while secondly, we can use them to develop new objects, pieces of armor and new weapons. The mod also adds a kind guidebook that describe us crafteos and functionality of objects, among other things. How to install Realistic Death Mod for Minecraft 1.7.10?